Today we want to take a closer look at a part of Barcelona which we have often seen from a distance: Tibidabo on top of the Collserola hills. The church on top of it, the temple of Sagrat Cor, the Ferris wheel and the communciation tower can be seen from almost everywere in Barcelona. The view over the city from the height of 512 meters must be quite something. We take the train to station Tibidabo from where (normally) Tram Bleu leaves, a more than hundred year old, wooden, trolley which is painted blue. But after half an hour waiting we and the other tourists find out that it doesn't go today. 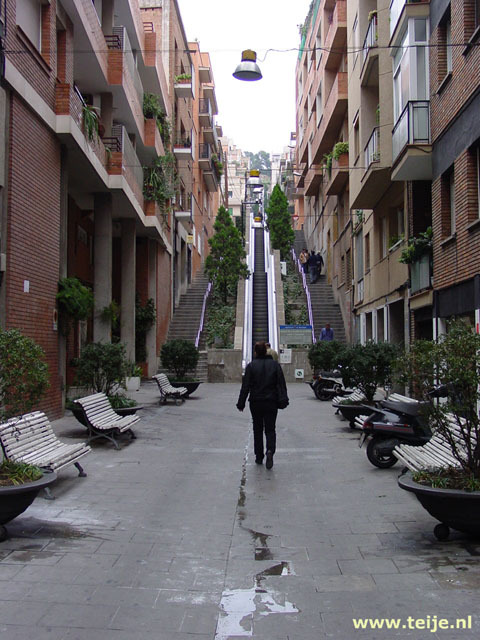 So, we take the bus which also goes to the station from where a funicular goes all the way to the top. On the way we see there are many nice building in this suburb and on top stands a nice castle. But we also find out that the funicular doesn't go either, so we have picked the wrong day, again... Later in the season (after August) it only goes at weekends. So we save the Tibidabo for our next visit, now we first walk back the road down to get a better look of all the nice architecture we have seen on the way up. Most houses date back to the 19th century when this area was a popular suburb for rich people to build their second home. Many buildings now house companies and most are well maintained. Well, I would like to have a second home here, that wouldn't be too bad! Cranes tower above the Sagrada and the work is not finished yet. The building of this cathedral is paid by donations and entrance fees (€ 10, € 7 with the Barcelona card). We have the impression that there have been a lot of changes over the last three years, so money must still be coming in. The construction started in 1882, but it will take a few more decades before it is finished. We think the building is already a jewel for the city. There are almost no straight lines in it, a cathedral of nature. The placement of the statue (which we observed last week) probably didn't work out, since it isn't there yet. It is also possible to climb the stairs (or take the elevator) to the bridge between the towers at a height of 60 meters. We have climbed the stairs last time and skip it this time, since we still feel a bit tired. More information about La Sagrada Famlia and its most famous architect Gaudi can be found on our Gaudi-page. Back at Placa Reial we nestle ourselves at a pub. I feel very tired, indeed. We have walked quite vsome bit over the last days, much more than we are used to. There are no festivities anymore and we agree that I go back to the hotel to get some rest and Teije has some energy left and wants to see the Egyptian museum. So he takes over from here. Well, since this is our last whole day here I want to see something else and I take the subway to Passeig de Gracia. When I enter the street I am on the side where I can see Casa Battlo, another building designed (or better siad, rebuild) by Gaudi. A long line is waiting outside the house, but I didn't knew it was open for visitors. Maybe later, when I have some energy left after my visit to the modern Egyptian museum. It is not far away and has three floors and an excellent and orderly exhibition. All texts are in Spanish but I get an extensive English book at the entrance with explanations for all the items. Photographing is prohibited, which is a shame, since they have some remarkable pieces here. In an hour I am finished with the museum and walk back towards Casa Battlo. A sign states that it is opened for the occasion of the 100-year existence of the building (it was already build 1904, but that year Gaudi started with his thorough renovation). The entrance fee is € 16 when you want to see all of it. I waver a bit about the price but I get another 30% discount with the Barcelona card. I decide to go for it. And the moment I enter the building I know I won't regret it! Not only the building is fairytale-like from the outside but even more on the inside, typical Gaudi, although his friend Josep Maria Jujol has also worked on the interior decoration. There is almost no straight line or corner to be found. 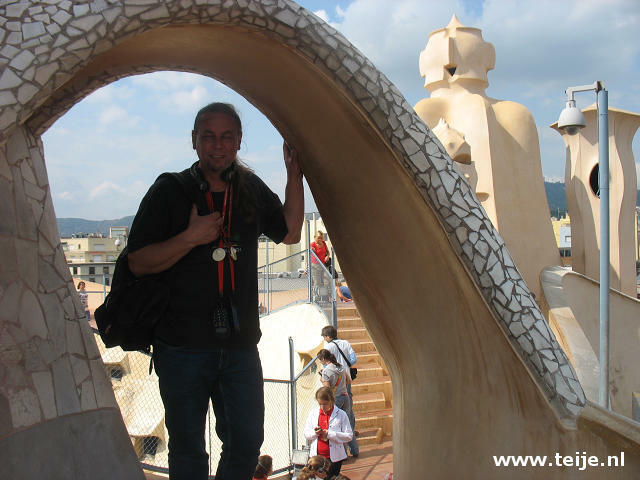 An audioguide is included in the price (English) and I get detailed information in every room about the ideas of Gaudi and how he applied them in special features of the house. Nature was clearly his big example. Through the stairwell I can walk all the way to the roof. And on top of the house it looks still fairytale-like. I can imagine that Gaudi and his colleagues would have liked to transform the whole street instead of only this building which stands between grey and colourless houses. The way down goes on another side of the house and I pass through a few more impressive rooms, like this one with arches where the light can do strange things. A fantastic building and I am glad that I entered the place, despite the high entrance fee. On the Gaudi-page we will show more pictures and give more details about the house. I feel rather tired now, too, and return to the hotel to show Elisabeth the pictures of Casa Battlo and to take a short rest. So we go to the Sagrada Familia which we haven't seen in the dark yet. But when we arrive all is dark. When we sit down at a restaurants suddenly all the lights go on to illuminate the front of the cathedral. In the light we can see that today they have succeeded in placing a huge Maria statue. Last week we saw two workmen trying, but until this morning it wasn't completed yet. But now they have. We return to Placa Reial, not too late this time, when suddenly all the lights go out. There are still many people walking around or sitting on the square and the atmosphere is very cosy. With or without light, the whole center of Barcelona is an attractive place to be. We stay out for a couple of hours since we can't get enough of the nice weather and watching the people pass by, including several artists. Our last evening here... we probably will be back some day!